Darjeeling: Adventure sport lovers can expect to have a field day during the upcoming tourism festival in the hills, with the organisers keen to promote the activities. "We are planning to promote adventure tourism in a big way during the festival and have decided to provide freebies to adventure sports lovers," said Sangay Sherpa, one of the organisers of the Teesta Rangeet Tourism Festival. The organisers have decided to make mountain bikes available for tourists at Darjeeling's Chowrasta free of cost during the December 27-31 carnival organised by the Gorkhaland Territorial Administration (GTA). "We will provide free mountain bikes to explore the town. On December 28, locals will take out a bike rally from Chowrasta to Chattakpur (near Sonada)," said Sherpa. Chattakpur, located in the Senchel Wildlife Sanctuary at 6,800ft, is and 20km from Darjeeling town. "We will also encourage tourists to take up climbing at Tenzing Rock, which stands almost 90ft high. Our guides will provide free training for three days starting December 27," said Sherpa. 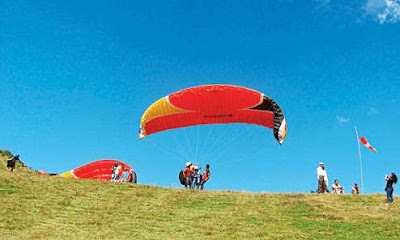 Sherpa, whose company Off Road Adventures offers paragliding from a spot near St. Paul's School to Lebong, will provide a 20 per cent discount during the festival. "We usually charge Rs 4,000, which includes transport facilities. However, during the festival, we will provide a discount," Sherpa added. Zorbing balls will be kept at the Chowrasta, one of the festival venues in Darjeeling. "We will put up stalls on adventure tourism to highlight the facilities. We will also promote white-river rafting," said Sherpa. The festival appears to be generating good vibes and drawing visitors. "A positive message is going out because of the tourism festival. In the last two weeks, there were hardly around 200 tourists but now there are around 1,500 in the town (Darjeeling)," said Sherpa. Tourism has been hit hard by the statehood agitation this year with footfalls plunging 90 per cent over last year's numbers. In the normal course, around 3.5 lakh domestic and 40,000 international travellers visit the hills each year. Adventure sport lovers can expect to have a field day during the upcoming tourism festival in the hills, with the organisers keen to promote the activities.